You know when people see Jesus in potato chips? Or in toast? This is kind of like that, but less delicious and not religious. That is, unless you think watching anime is some sort of holy experience. A recent thread on 2ch, Japan's largest bulletin board, was pouring over this image by Johannes Schedler at the Panther Observatory. The image, which dates from 2008 (so old! 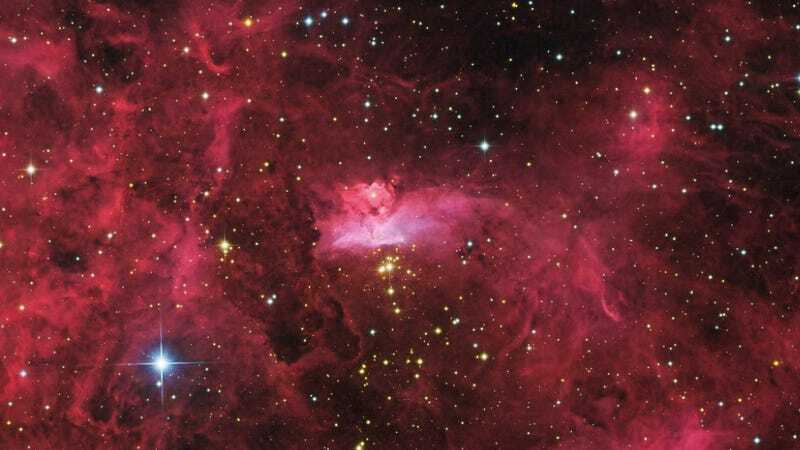 ), shows NGC 6357, a nebula complex located approximately 8,000 light years away. This post has anime spoilers! Folks on 2ch didn't see stars and molecular gas. They saw "Ultimate Madoka" from the popular anime Puella Magi Madoka Magica. If you don't follow that show, Ultimate Madoka is the ultimate magical girl form character Madoka Kaname takes at the end of the series. Is There Really a Hidden Message in These Phantom Pain Screenshots?